Genealogists count themselves fortunate when they have old family photos. The older the better! Images play a tangible role in bringing family history to life. You can scrutinize for facial similarities, marvel at the fashion trends from decades ago, and imagine a personality based only on a glint in the eye. A picture tells a story in a way unlike any other component in genealogy's toolkit. Is it any wonder genealogists prize them so highly? If we're fortunate, all of our photos are labeled and we know the identities of those captured on film. Unfortunately, that's rarely the case. My collection - like many, I'm sure - includes dozens of pictures that were never labeled. I'm afraid the identities may be lost to time unless a distant cousin comes forward with answers. I've had great success using this blog and other social media to connect with distant cousins and collaboratively identify some previously unknown pictured individuals. 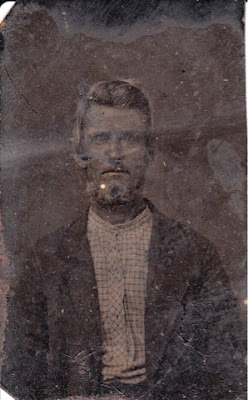 Remember when I identified the photo of my 4th great-grandfather George Chalkley Haworth? Among my unknown photos, I have a small handful that I prize above the others and hope to identify. Perhaps they're my direct ancestors waiting for me to uncover the clue that will give them back their name and a spot on the family tree. This is my favorite unknown photo. It's a tintype and the woman's stern gaze pulls me in with her serious no-nonsense demeanor. She was in a family photo album that belonged to a maternal great-grandmother. 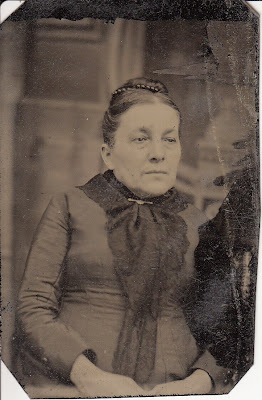 I speculate the photo dates to the 1870s based on the woman's approximate age, her fashion, and that it's a tintype. Working with this timeline, I wonder if she may be one of my 4th great-grandmothers. Is she Mary Ann (Miser) Benedick who lived in Plainville, Kansas until her death at 92 years of age in 1901? Or is it Sophronia (Rogers) Dornon who died at the age of 57 in 1872? Or maybe it's someone altogether different; perhaps just a friendly neighbor always willing to loan a cup of sugar. Hopefully a cousin is out there with a labeled copy and the answer. The second photo was in the same album as the woman ranked number one above. In fact, it's the only other tintype in the album and sits opposite her photo. Surely they must be from the same family line, right? It looks to me like it could be from the 1860s or 1870s. Are they sons of the woman pictured above? 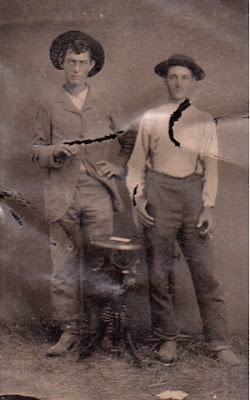 The man on the left appears similar to my 3rd great-grandfather Albert Benedick who was born in 1849. If he was pictured, it would lend credence to the photo above being Mary Ann (Miser) Benedick. The third photo belongs to an album on my mother's paternal line. It's a cabinet card and dates to - I would guess - the 1890s or the early 20th century. Take note of the photographer's imprint and location in Fayetteville, Arkansas. I wonder if it's one of my 3rd great-grandmothers on this line. 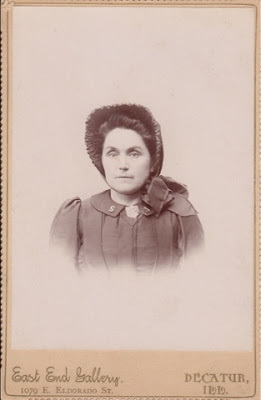 Could it be Samantha Pauline (Brickey) Winkler Lee who was born in 1857 and died in 1899? She lived alternately in Arkansas and Missouri (where she was buried). In 1891 she married James Russell Lee in Fayetteville. 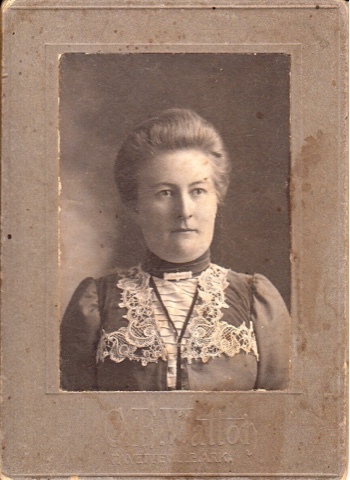 Or could it be Mary Jane (Calfee) Wagnon who was born in 1841 and died in 1914? She lived most of her life just outside of Fayetteville in Washington County, Arkansas. The fourth photo also belongs to an album on my mother's paternal line. Unlike the picture above, though, it's a tintype. I think it dates to the 1870s. The man's gaze is hard and direct. His right eye looks like a cat's. I think a minor bend in the tin warped the image and created the spooky look (or is it possible that he suffered from a real ailment?). He could be any number of great-grandfathers on this line. Perhaps it's John W. Upton who was born in 1828 and died in 1899. Or it could be John Wagnon who lived from 1841 to 1923. Or maybe it's Samuel Winkler who lived from 1831 to sometime after 1900. The last photo depicts a young woman wearing a Salvation Army uniform (an important clue, I'm sure). The photographer's stamp indicates the picture was taken in Decatur, Illinois. There's a strong similarity to my Dornon family line. I believe the woman may be Lucinda E. Sophronia Dornon who lived from 1854 to sometime before 1910. Lucinda lived for a short time in Decatur, Illinois in the 1890s following the untimely death of her first husband Sylvester Scannel. I've puzzled over these photos for countless minutes. I've spent so much time thinking about who they could be that I've started to imagine which of my ancestors they may be. Of course, I would love for them to be my forbearers, but I concede it could all be wishful thinking. That's the curse challenge of inheriting unlabeled family photos. Let this serve as an impetus this Thanksgiving holiday to share your unknown photos with family, pick your elders' brains, and properly label them before it's too late. I'm hoping someone does recognize them. Fingers crossed! Thanks for stopping by, Elizabeth. I appreciate it. The 2nd picture of the 2 men: the man on the right strongly resembles my grandfather. H S Benedict son of Robert George s/o Samuel M s/o John & Mary Ann Miser Benedick.. The resemblance may help us to confirm, as I suspect, that the tintype is of Benedick family. I think the photo may be too old to be H.S. Benedict, but perhaps of Samuel?